Jason Turl is the quiet achiever sitting behind you in a filled out classroom exam. Modest in his ways he has lots to brag about. He is a young adventurer in an old Stetson hat daring to risk life and extremity to lead the war against uneducated opinion. A passionate young man aged 23 who has seen the world countless times over enjoys life to the maximum at ultra-speed. Everything Jason does is full throttle. From feeding deep sea sharks to wrangling deadly dangerous Australian snakes his ultimate goal in life is to change the common misconception about the not so fuzzy and unloved animals which reap havoc upon primal senses in ordinary everyday house wives. He takes praise in his stride for performing such death defying tasks such as rescuing harmful snakes from back yard orchard fruit netting. Something he has been doing for years as a volunteer for the Wildlife Information and Rescue Emergency Service (WIRES). Jason’s passion for thrill seeking animal encounters began at an early age and he still has much to learn. He wishes to never stop learning; he always absorbs information shared with him, especially if that snippet flows from the mouth of a well-educated professional in the field of reptile ecology. Jason loves animals with scales, everything from 10 foot goannas to flying fish. A keen angler he is always respectful to the sustainable thresholds of nature. 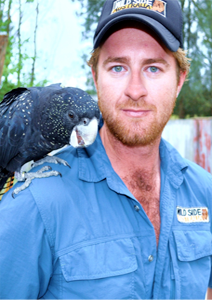 Turly or Pinky as he is affectionately known to Brendy and other mates also works in the environmental restoration field with Brendy and has obtained Tafe certificates and extensive experience through lifetime experiences relevant to the industry. 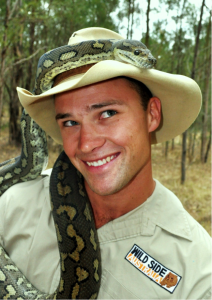 He has managed to stay in the low paid profession through his love of Australian wildlife for many years to date. Mr Pinky has traversed the globe in search of the ultimate adrenaline rush. He has skydived throughout Australia, bungee jumped in Switzerland, abseiled throughout the Australian Great Divide; rock climbed the Czech Republic and dived throughout the south pacific. However, He has always found himself at home and bursting with the energy rush he yearns for by interacting with dangerous wildlife. In his downtime you can catch Jason on the football field, in the gym, deep under the water surface or out enjoying the natural serenity in his hometown bushland of Kentlyn, NSW. Kentlyn is Australia’s last stronghold for chlamydia free koalas. A fitness freak torn from the grasp of festival life and thrown into the bush he is an enjoyable character with much life and passion always eager for a good laugh keen to educate and share his momentous and continuous life experiences. Knowledgeable, fun, loving, mysterious, alluring, romantic and good looking are all words which describe Brendon Levot. He’s got an addictive personality and an unstoppable exuberance and passion with all aspects of the natural world and he wants to share his know how with you! He’s mad keen on birds of the two legged variety and oozes experience and useful facts, although only amateur he has built himself an unbreakable reputation as the go to guy with any sort of bird brain question within young naturalist circles. Brendy the dude is an ornithologist without having the pleasure of joining the degree club as yet, his know how stems from spending endless hours nerding it up in his down time. He spends every spare waking minute wading through swamps and bird books to learn about our avian feathered friends which he holds so close and dearly to his heart. When not out binoculars deep in the nether reaches of the wilderness chasing down the rarity of a lifetime he is working hard to conserve our natural ecosystems as a bush regenerator, a career which has spanned over 13 years and he’s only just turned the ripe old age of 26! A volunteer of all sorts and a managing director of two companies and projects director of a third is proof that he cannot say no, his can do attitude isn’t only restricted to business, but his lifestyle. Brendy Takes charge of dim witted ideas inspirational only to young lads building grandeurs tree house’s to maximise his potential of getting the perfect view of seldom seen birds. A true bush man, which is a rarity in itself amidst modern times, he can survive in the wilds no worries. In true MacGyver’esk style he can and will quickly catch you a tasty dinner using only a shoelace, a thumbtack and a feather plucked from his hat to cook a 5 star continental meal below a heated pile of ambers, even though he detests the smell, taste and sight of seafood which is a true testimony to his endurance throughout harsh scenarios. He once came last in a cook up at a bush tucker festival in outback New South Wales, who would’ve thought charring a flounder transported for hours from ocean to the Australian outback in open flames would have been so deserving of such a score. Learning about the topics which interest Brendon so greatly through various Tafe courses was a good source of enjoyment for him over many years; however he found his studies to be distracting to his passion of the natural environment. Instead of learning how to manage land use he would rather be out practising his knowledge. A keen interest in engineering and the workings of automobiles saw him also obtain a certificate in mechanics, a skill which has proven useful in stressful remote car trouble situations. He is a true master of jump starting flat car batteries. A musically gifted harmonica player Brendon is self-taught by the camp fire with only a little coaching from some of Sydney’s best performers over a few lime cordials. He always relishes the chance to pull the harp out and bust a tune to anyone who will dance along. Brendon Levot Is a young Aussie larrikin who’s larger than life on a mission to enjoy his time and the natural world around him. Meet Kate Berry, an intrepid spirit that thirsts for adventure, a leader who is extraordinarily talented in the art of photography and passionate in the field of conservation. Kate is a master of perfection and not shy to spend hours to days on end in fogs, forest and icy plains in pursuit of the ultimate image as second best for this almighty talented pro is never enough. Her interest in photography and nature was sparked as a young woman and inspired by the likes of Sir David Attenborough, Lyndal Davies and Jane Goodall. Kate's tenacity and perseverance has given her the capacity to form her own life's journey trail blazing for excellence standing high upon the shoulders of her idols. Wether it's scales, fur or feathers nothing restrains Kate Berry from roadside wildlife rescues, something she has continued since her early childhood years. Kate's commitment and determination have enabled her to gain a university scholarship majoring in animal behavior and ecology, this is a true testament to her can do, I am woman, hear me roar attitude. When Kate isn't researching coastal ecosystems, pelagic birds or cuddly koalas at university you can find her out exploring her backyard, the wilds of the Queensland bushland, where she draws relaxation and inspiration from. Kate is a keen ornithologist and mammal enthusiast who is determined to promote conservation by capturing the beauty and mystery of the natural world through her lens. Kate is also a prolific author, and a fearless traveller, one is effortlessly persuaded to the depths of nature as she details her accomplishments with precise measurement and fine point both chapter and verse. If your looking for adventure inspiration then take your queues from the newest allure of the WILDSIDE Australia community.